12 incredible caves to explore this year! No doubt about it: America has some amazing natural attractions. But while most people think about Niagara Falls, the giant sequoias in California or the Grand Canyon, there are some must-see sights --underground. Caves have always fascinated humans. Prehistoric man used them for shelter. Native American tribes considered caves "sacred" and tested the bravery of their warriors by sending them into their dark recesses. Pioneers used caves to refrigerate food, and during Prohibition, caves became "speakeasies" or a place to hide an illegal still. The U.S. alone is home to over 55,000 caves. That's right: over 55,000. But these are 12 of the coolest. Enormous stone columns tower over you within the cathedral-sized "rooms" of this cave system located in the Shenandoah Valley. Over a million and a half people visit each year to see things including the popular Stalacpipe Organ: it plays "music" when tapped with a special mallet. This one comes with a warning for only experienced spelunkers and cavers to visit: people have died exploring it. The reason? It contains two of the deepest drops in the continental U.S. "Incredible" drops 440 feet, while "Fantastic" is a 586 foot drop, deep enough to fit the Washington Monument. The 60-foot waterfall inside the cave, reminiscent of the falls in New York, inspired its name. Explore 400-million-year-old fossils and formations, like the 20-foot tall "Battleship." There's also a wedding chapel inside the cave! At 400 (explored) miles, it's the longest-known cave system in the world. The steep hills, tricky labyrinths and vast chambers have attracted tourists since 1816, making it one America's oldest attractions. Named for its 60-foot limestone bridge, visitors can travel 211 feet underground to witness a cave that's still being formed by water. One of the coolest features is the Bracken Cave, home to the world's largest bat colony. It's considered one of the most beautiful caves anywhere in the world. The reason? The hundreds of unusual pink and rose-colored limestone formations - like "soda straws." These long, thin stalactites grow up to 4 feet long and are a popular feature. This cavern system in the Ozarks was supposedly a hideout for notorious outlaw Jessie James! 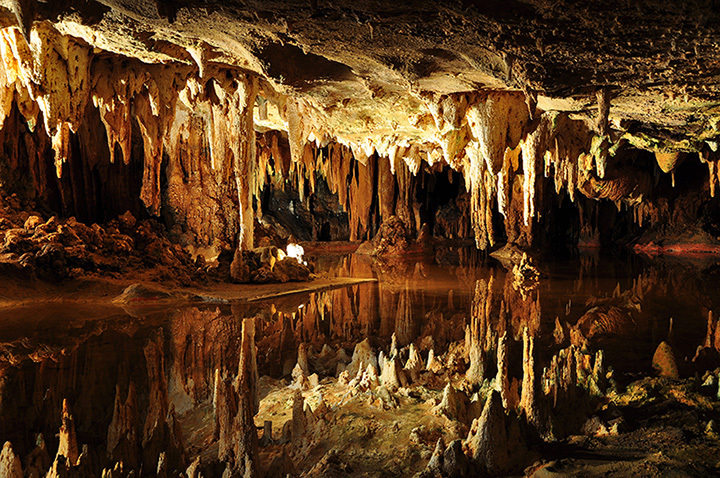 With 6,000 caves, Missouri is known as the Cave State - but with seven "levels," Meramec Caverns is the largest. With over 166 miles of passages, it's the third-longest cave anywhere in the world. The largest room (discovered so far) is the "Big Duh": 570 feet long, 180 feet wide and 30 feet tall! Tours are offered for experienced cavers, as well as those who just want to gaze open-mouthed at this natural wonder. Beneath the prairie lies the densest, most complex cave system in the world. Winds move in and out of the cave in unique, and often dramatic, fashion - one reason it was considered a sacred site by Native Americans. It's home to a rare formation called "boxwork," which looks like a honeycomb or spider web. It's one of the biggest - and deepest - caverns ever found, with 120 known chambers, and breathtaking formations like the Giant Dome and the Painted Grotto. The deepest part is 1,027 below the surface. No wonder it's been referred to as "the Grand Canyon with a roof on it." In the 1850s, gold miners were lured to its entrance by a strange "moaning" sound. Perhaps it's the spirits of those unfortunate prehistoric people who fell into it? The cavern is their resting place, home to some of the oldest human remains in the world. Today, you can take a much safer walking tour, or rappel down a 165-foot drop into the main chamber. Over 2,000 years ago, lava flowed down Mt. St. Helens, forming the longest "tube" in the U.S: more than two miles long. One cave will have you scaling an 8-foot high "lava fall." When you emerge from Ape Caves, keep an eye out for Bigfoot: he's known to inhabit the area!